The 18-month from the DOL is now official. The Transition Period for the Fiduciary Rule’s Best Interest Contract Exemption and the Principal Transactions Exemption will move from January 1, 2018 to July 1, 2019. During the extended period, fiduciary advisors “have an obligation to give advice that adheres to impartial conduct standards,” said the DOL. As many of you are aware, the U.S. Securities and Exchange Commission (“SEC”) issued a final rule in August 2016, which significantly expands the information required in Form ADV Part 1. The compliance date for the rule is October 1, 2017, and all investment advisers making Form ADV filings on and after that date will need to include the additional information, as applicable. Below is a summary of the areas in the document that are materially affected. I want to be sure that you are aware of these changes as this will require some work on your part to be ready to provide the information for Item 5 as part of your annual updating amendment in the first quarter. Please read the information below and work with your portfolio management application provider to determine how you can provide this information. You may want to run the numbers as of 9/30/17 to be sure that you are prepared. Item 1F(5) – List the total number of offices, other than principal office (which is referenced Item 1F). In Schedule D for Item 1F, you will be required to include the (i) address, phone and fax number for each location; (ii) number of employees at that location, (iii) other type of business activities performed at this location; and (iv) description of any investment-related business activities conducted from this location. Item 1I – Check this box if the firm utilizes social media sites (e.g., LinkedIn, Facebook, etc.). In Schedule D for Item 1I, you will be required to list the address of all social media sites utilized by the firm. Item 5C(1) – Provide the number of clients for whom you do NOT have regulatory assets under management, but provided investment advisory services during the most recent fiscal year. The total RAUM from Item 5D must be consistent with Item 5F where your RAUM are listed as either discretionary or non-discretionary. Item 5F(3) – Provide the RAUM (reported in 5F(2)) attributable to client who are non-United States persons. In Schedule D for Item 5I(1) provide name of sponsor for each wrap program participated in by the firm, including the sponsor’s SEC and CRD numbers. You are not required to enter anything in Item 5I if your involvement in a wrap fee program is limited to recommending wrap fee programs to your clients. Item 5J(2) – Indicate whether the AUM reflected in Form ADV Part 2A is calculated differently than the RAUM reported in Form ADV Part 1. Item 5K(2) – Indicate whether you engage in borrowing transactions on behalf of any separately managed account clients that you advise. If so, please let me know as there is other information that will need to be provided. Item 5K(3) – Indicate whether you engage in derivative transactions on behalf of any of the separately managed account clients that you advise. If so, please let me know as there is other information that will need to be provided. Item 5K(4) – Indicate whether any custodian holds 10% or more of SMA RAUM. Report RAUM attributable to clients other than those listed in Item 5D(3)(d)-(f) (see list above) (separately managed accounts). * A separately managed account (SAM) is defined as advisory accounts other than pooled investment vehicles (e.g., registered investment companies, business development companies and private funds). Based on this definition it is my understanding that an SAM is a mutual fund, ETF, and individual stocks. In Schedule D for Item 5K(4) provide the following information for any custodian that holds 10% or more of your aggregate SMA RAUM. (d) Is custodian a related person of the firm? CHICAGO, Oct. 26, 2017 /PRNewswire/ — Morningstar, Inc. (NASDAQ: MORN), a leading provider of independent investment research, today announced the launch of the Morningstar Best Interest Scorecard, designed for financial advisors to help clients make an informed decision on possible rollover options designed with their best interests in mind. This new tool demonstrates Morningstar’s ongoing efforts to prioritize investors’ best interests in light of changing regulatory requirements for retirement accounts, as well as evolving investor preferences and global trends around investment advice. The Best Interest Scorecard is available as an add-on feature in Morningstar® Advisor WorkstationSM. 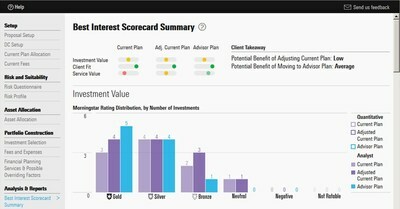 The Best Interest Scorecard is a comprehensive tool that enables advisors to assess the client’s current investment plan; changes the client could make within their current plan; and the new portfolio and service offering that the advisor is proposing for the client through a rollover or other process. Investment Value: The expected returns and costs of 97.5 percent of US mutual fund and ETF assets, powered by our research team’s ratings and methodology. Client Fit: Overall efficiency of the asset allocation relative to Morningstar® Target Risk Indexes1 and the ability of the plans to deliver a portfolio that matches the client’s risk profile. In a sample of retirement portfolios, Morningstar found that 90 percent were aligned with the asset allocation and diversification embedded in the Target Risk Indexes and 10 percent were not2. Service Value: The net benefit of financial planning services provided, dynamically mapped to the investor’s needs. Morningstarresearch has revealed that these services can add more than 20 percent to an investor’s income in retirement before fees.3 Examples include life insurance advice, estate planning, behavioral coaching, rebalancing and annuity purchase decisions. The Best Interest Scorecard also allows advisors to capture other client factors, such as appreciated employer securities, financial health of the investor and employer, or desire to work with an advisor, without weighing these factors explicitly in scores. The Best Interest Scorecard is fueled by Morningstar’s proprietary research including the Morningstar Quantitative RatingTM, asset allocation models and portfolio analytics to assess portfolio risk and returns-based style, and proprietary measures of the utility of advisory and financial planning services to investors at different stages of their investing career. All these have been assembled into a concise decision architecture that enables advisors to assess the net benefit for their client of changing to their proposed plan and portfolio from an existing one. Please visit http://www.morningstar.com/company/dol-fiduciary-rule for more information about the Morningstar Best Interest Scorecard and Morningstar’s Best Interest Solutions. Learn more details about the research behind the Best Interest Scorecard at http://www.morningstar.com/blog/2017/09/28/rolling-over-401k.html. With all of the disasters in the past couple of months (hurricane, fires, floods) now is a great time to determine the adequacy of your Disaster Recovery Plan (“Plan”). You are required to “test” your Plan each year. Riding out a disaster is an opportunity to “test” the Plan. Create an after-action report if you will and document this “test”. Your “test” didn’t occur if it isn’t documented, so be sure to document what you did and what you learned. I have been reviewing several Plans in the past weeks as part of the Annual Document Review for clients. After discussions with those clients that have been through a disaster recently and reviewing these Plans, I feel it is important to have a hard copy of your plan handy AND that the Plan include the information that you need to know in the event that you don’t have access to anything at your office or in the cloud. Access to the cloud is not a guarantee during a disaster – as many people can attest to during the past couple of months. When reviewing your Plan, take a look at the details – do you need to add account numbers or policy numbers in the event of a disaster? Is the person that is responsible for completing something as part of a disaster preparedness the only person that is trained to do this process? If so, what happens if they aren’t in the office when this process needs to be performed? One of my clients discovered during their disaster preparation that the only person in the office that knew how to forward the phones was on vacation. So their preparations were slowed while they discovered how to forward the phones. You’ll want to really look at the Plan and determine if you will be able to recover from a disaster with the information in the plan alone.